My Handful of Dust from FatCatKnits all spun up. Still not sure what to do with 82 yards of it, but it makes me happy. Then I moved on to the merino/silk blend top I bought at last year's Rhinececk. It doesn't quite please me as much as the first yarn did, but it satisfied the burning roving lust I was suffering from. There is about 100 yards of this one. It is less lumpy than my first attempt, which I suppose is forward movement. The kind enablers at Ravelry answered my desperate plea for local roving by directing me to the fine folks at KnitKnack in Maplewood, NJ. Where I immediately fell to the floor and fondled every braid of Fleece Artist merino sliver that they had, which for the record was a lot of braids. I chose four of similar color so that I could conceivably end up with enough yardage to actually knit something with. I am also getting a little more consistent with my singles, and they are a tad bit thinner which should not only help my yardage, but is making my roving supply last a little bit longer, hopefully saving me from having to run out and buy more every other day. I almost forgot - I had a great time visiting with Kathy and Steve Elkins from Webs on their podcast Ready, Set Knit! Click on Show 51 to listen in. Oh - and another gratuitous sheep picture, this time with me in it! 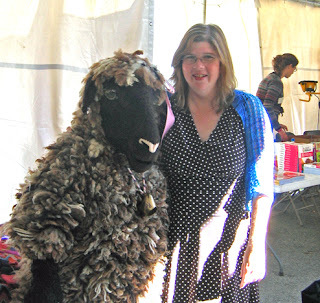 Love me some Rhinebeck sheep! Do you want plies with that? 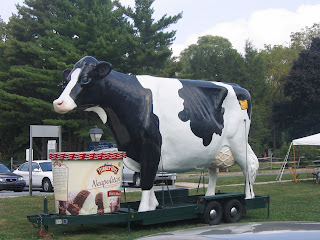 Holy cow - an actual post with photos two days in a row? Don't count on it ever happening ever again, but all of my spinner enabling friends have begged for photos of my weak plying skills - I suspect so they can point and laugh - so I figured it was easier to post than to put everyone off. And yes I stole that title from a book, but since it was my book, I don't think the plagiarism charge will stick, thank you very much. Up top - the merino top I bought at Rhinebeck. The colorway, since I didn't mention it yesterday, is Handful of Dust. Yummmmmm. The photos are a bit out of order but I am too lazy to fix them right now, so there you have it. I had two bobbins worth of singles, and of course when I plied them I had a few yards left over on one of them, so I tried a bit of Navajo plying. I really, really like that technique, although it won't be a good choice for me overall until I get my singles a little bit (or a lot) thinner because the resulting three ply just barely fit through the orifice. But I really like how the color changes were more noticable with that ply. 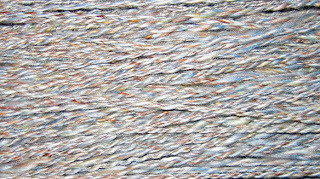 Here is a photo of my 82.50 yards of extremely thick and thin 2-ply yarn. Why no, I can't find my niddy-noddy and wrapped the yarn around an old cookie sheet to steam and set the twist - what made you ask? :-) Still can't decide what to make out of it, but it will be made soon, because of all that instant gratification need I have floating around this week. 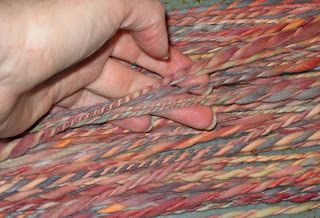 To satisfy my needs in the meantime, I dug through the house looking for any fiber I could find, and remembered some merino silk top I had bought last year to use with my drop spindle. 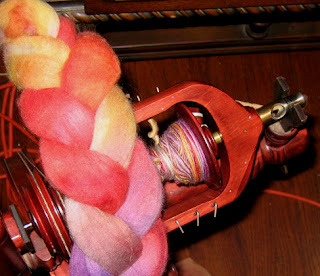 I spun a bobbin full of that last night, and will probably finish off the rest tonight. In the meantime I have posted on Ravelty that I need to buy more merino top in the state of NJ right NOW and some fellow crazies have hooked me up with a place to go - more on that after I get there. and the only reason it isn't knitted up is that I can't stop spinning. Photos when it's finished, but it contained two balls of fluff (that the Kid has stolen for her experiment spinning), and enough beautiful blue laceweight to finish the dainty little necklet design that was included in the package. Go see them - tell them I sent you, they were very nice! Last but certainly not least we have what the Kid blew her money from Pop-pop on - an alpaca teddy bear. His name is Tickles. Last year she was quite incensed about toys made from dead alapacas (as opposed to fleeces which don't bother her at all), but last year the vendor took the time to explain to her that in the economy it came from, every part of the alpaca was used after its demise - and that alpacas weren't killed before their time to become teddy bears, if only because they were more valuable while they were producing fiber. She pondered this in the twelve months between events, and decided that it was okay for her to purchase one. I love the amount of thought she put into her purchase. I am off to babble some more - I am going to be on the Webs podcast soon and we are taping today. Wish my luck! Don't get evil thoughts, it is a fiber and fun hangover, I only managed to snarf down two beers over the entire weekend. I sort of sucked at taking photos, as usual, but herewith - the parts of the weekend that I actually managed to record. First off - I got my wheel! The one I wanted! And used so it was affordable! And already set up! 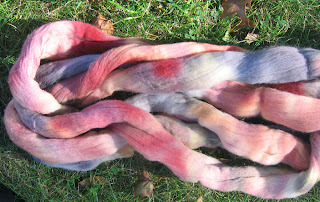 And I have already spun all the merino top I bought so I have to find more! OK - enough of that, but you get my point(s). 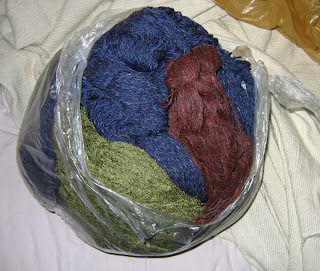 Here is a big bag o' shetland yarn that I bought from Shelby something or other - ILoveYarn.com? Anyway I fell in love with the black/red, and the deep blue and at $14 for a thousand or so yards, I bought both. 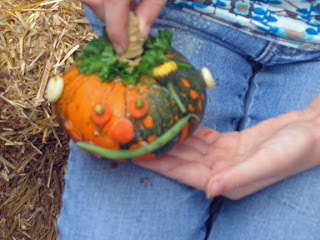 The Kid chose that green chenille-ish stuff - similar to the Berocco. Lovely lovely roving was a last minute purchase from Ravelry's own Yarn Fairy, Gwyniver. 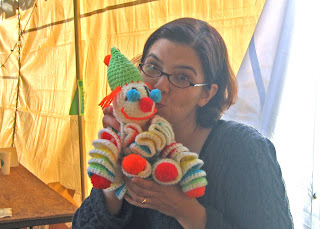 Not to be confused, which I did earlier, with the fiber elf who dyed my treasure Fat Cat Knits. 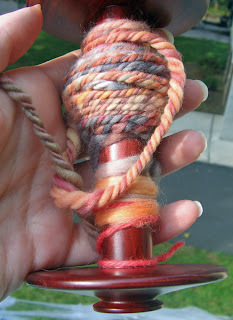 I have already spun and plied every inch of it, and I want more, damn it, more NOW! Ahem, sorry, I am currently addicted to the spinning wheel and had to be forcibly parted from it to share with the Kid, who is learning quite quickly. 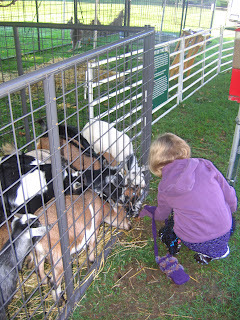 Speaking of the Kid, there she is with every goat in the place trying to get the food from her hand. This was taken early Saturday morning and they were hungry! 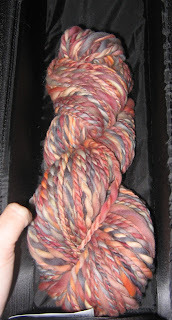 I love the UPS guy - he brings me such lovely yarn, and unlike the mail guy he doesn't bring me any bills. 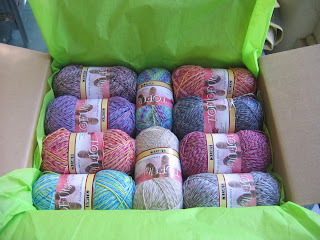 This arrived from Southwest Trading yesterday - yummy payment for the last pair of socks I did for them. Tofutsies in nine different colorways. There is a double because the Kid scoped out the color choices ahead of time and claimed one for her very own, so I wisely asked for two so I won't have to go without myself! 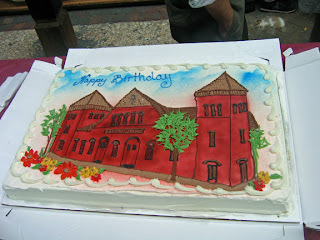 I was planning on showing close up photos, but the Blogger photo system is being cranky this morning, so no luck. I did a lovely book signing last night at Secaucus Public Library. Well I did a discussion, there were no actual books, which was mildy frustrating for all concerned. But Womrath's in Tenafly has some signed copies for those of you locals that want one, and of course they can be gotten elsewhere. A wildly prolific Project Linus group meets there and they impressed the hell out of me with both the beauty and the quantity of the blankets they were putting out. Well done ladies! And a few more photos from Lancaster. Here we have a big giant fake cow, followed by two big giant real cow-like creatures. Oxen? I don't know, but I couldn't get over how big their heads were! They were pulling a large cart for the tourists to ride in. On the Irish dance front - two big wins for the Kid this weekend - the exact trophy she needed (and one for good luck) to move up permanently to Preliminary Champion. She was so happy when she found out she stood there and cried in the results room. I know some of you are not into the whole Irish dance thing, but let me just say that this was a BIG FREAKING DEAL and the Kid and I are both so happy we could burst. Tons of work to do this week so I can relax with a clear conscience at Rhinebeck (did I mention it is only five days away?) so I must get to work. Saturday 1 - 3, Ellen's Half Pint Farm, building 26, booth N. I will be collecting preemie hats for Hats for Alex, if you are so inclined. Sunday 10 am - the giant author tent of chaos. Me, the Harlot, the Mason-Dixon ladies, and Stitchy McYarnpants and many others courtesy of the fine folks at Merritt Books. 1 - 3, back at Ellen's Half Pint for more frivolity and more hat collecting. PLEASE say hello, even if you don't want to buy a book or have one signed. I love meeting my internet friends. Friday night I did an event at the Heritage Center Museum, where I met lots of knitters and made great wonking progress on my Socks That Rock socks, much to the delight of the non-knitters who wandered by. I finished one sock and got the ribbing and part of the leg done on the other. I find being confined to one space with only one knitting project goes a long way towards avoiding Second Sock Syndrome. We woke up Saturday to discover that in addition to the regular Central Market hours (which was cool enough on its own - the Kid said her cinnamon bun was the best she ever tasted in her entire life!) 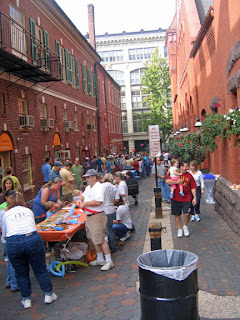 there was a birthday celebration/street fair in full force. It looked a little like this. And there were many many things for eleven year old's to do. Like eat cake, and paint wooden shapes, and get balloon animals, and wander into the market 14 times, and.... you get the idea. who is a little blurry but cute none the less. And look who I found! 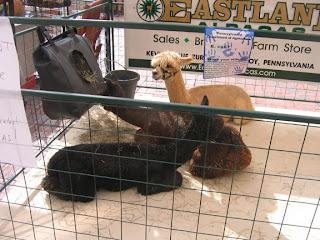 Three furry friends from Eastland Alpacas. Fiber - it's everywhere. 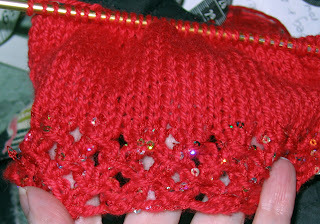 On the work front, I have three stories on loggie topics to finish up, and a red sweater for Soysilk. I was hoping to get it finished for Stitches East, but no go - the sleeves are annoying me more than I thought they might. Counting the minutes until Rhinebeck. 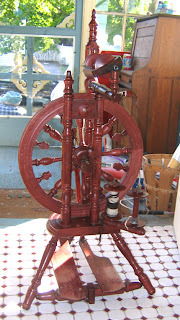 And now that I got my invitation to Ravelry I am just too busy dreaming about yarn for words. Socks that really do rock! Been working my way through the Stitches Midwest purchase pile. I am indulging in some "anticipation adds greatly to the pleasure" procrastination on the Qiviut yarn, but I couldn't keep my hands off the Socks That Rock. This is the lightweight, color Space Dust, in the pattern that I just did for Tofutsies that you can't have yet, but will get soon! It doesn't really spiral when worn, although it looks like it does in the photo. I love love love this yarn. You know how sometimes you hear about some fabulous yarn or pattern, or read it about it on the Internet, and then you run off and get what you covet, only to be disappointed because it doesn't float your boat? NOT the case here - I am in love. And I get the side benefit of being able to avoid the yarn for STR at Rhinebeck, because I already have some! Color me happy, and smug. 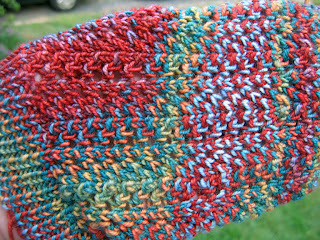 I may even get them finished in time to wear to Rhinebeck, but no promises - life goes on as usual here at Chez Hectic. Speaking of Rhinebeck - Blogger Bingo is happening again. Woo-hoo! I had SO much fun doing this last year and I was only there part of the day on Sunday. Now that I will be there both days I get to play even more, and torture more strangers. I say again, Woo-Hoo! 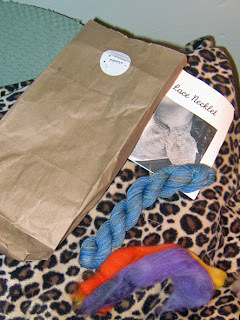 Yarn and sheep and torturing strangers - what a weekend! Speaking of Rhinebeck again - I seem to be always speaking of Rhinebeck - I will be doing book signings for Secret Language of Knitters on Saturday and Sunday at the booth of the lovely and talented Ellen of Ellen's Half Pint Farm . I will be there from 1 - 3 both days, so come say hello and get your books signed, or just introduce yourself. Then go buy lots of yarn from Ellen. I know I have mentioned this before, but it is the worst kind of torture trying to stay on a budget when you go hang out with yarn dealers for a living. At least if I am being roundly ignored (an author at a signing's worst nightmare) I can shop!